In Part 4, we saw how our genes may be driving the process of gluttony. This is the last installment in “Gluttony”. Before we leave this sin, we’ll take a visit to Dante’s vision of Hell, and his view of the Gluttons. Gluttony, then, is when the body takes in more energy than it needs. “Need” is defined by a complex mix of hormones, hypothalamic settings and body composition. If the glycogen tank is empty, the first 2000 extra calories are stored as glycogen, ready on a moment’s notice and easily burned. When the glycogen tank is full, at about 2000 reserve calories, then the excess is stored as fat, which is harder to get rid of and not so easily burned. The balance can be tipped toward fat storage by the hormonal makeup of the body, and as we’ll see, the hormonal balance is tipped by fat storage. It’s a complicated example of what scientists (influenced by engineers) call a “positive feedback loop”. Fat has a lot of chemical bonds. All those bonds in fat contain a lot of chemical energy. When the fat is broken down, that energy is released. Fats in our food give us about 4000 calories per pound; proteins and carbohydrates (sugars), less than half that. Fat (“adipose tissue”, if you want to be polite) is a selfish organ. It uses hormonal signals to command the formation of more fat. More of the body’s energy is then stored as fat, and the cycle spirals ever downward, towards overeating and obesity. The body takes in excess food calories; the extra calories are stored as fat; the fat directs the body to seek out more calories; the body takes in excess food calories. Gluttony ensues. As Dante and his party descend to the third circle of Hell, not far from the entrance and so inhabited by a sort of minor sinner who is still subjected to unspeakable torture, they encounter the Gluttons. The health effects of gluttony, and the social stigma that goes along with it, makes its victims want to approach the perfection that Dante’s sinners craved. Still, gluttony is a tough nut to crack. The mechanisms that control “normal” feeding behavior are complex. Our understanding of the ways in which fat works as an endocrine (hormone-releasing and hormone-receiving) organ are incomplete. Over and over again, scientists have identified a “magic bullet” such as leptin, only to find that the system is designed with multiple control loops, all knotted together and all designed to be resistant to any intervention. No single factor seems to be enough to banish gluttony. The stakes are high. Fat’s effect on health are well-known, and it would only make me a scold to recite them. Obesity almost always leads to a follow-along disease, only defined in the last few dozen years, called “Syndrome X” or, more recently, “metabolic syndrome”. Metabolic syndrome is comprised of: a waistline that is too broad, too much cholesterol in the blood, increased blood pressure, too much sugar in the blood, a tendency of the body to overreact to damage, and a propensity for the blood to clot. Let’s take these one at a time. A waistline too broad (more than 40 inches for men, 35 inches for women) explain what you’ve heard about the “apple” body type (lots of fat around the waist) versus the “pear” type. Somehow, fat deposited around the waist seems to be different, probably because it tends to release more hormones. Cholesterol is needed to make the wrappings which keep your cells intact, but too much of it can deposit in the arteries. Cholesterol can’t travel by itself in the blood; it needs to be shepherded to the cells by a carrier protein. Most people have seen the cryptic terms “HDL” and “LDL” on a lab report after their blood is analyzed. The different combinations of lipid and protein form the different subcategories that labs measure. You know from the last time you made gravy or chicken soup that fat floats; floating means low density; so “low-density lipoprotein” (LDL) contains more fat than protein, and that’s the more dangerous kind of cholesterol. Increased blood pressure occurs because the body is under constant stress; there are more blood vessels, they are narrower than they should be, and they get clogged with fat and clots. Increased blood sugar is the hallmark of type II diabetes mellitus. Remember the role of the hormone insulin: to move glucose from the blood into the tissues of the body, which need it for energy. As far as we know, something in the hormonal mix caused by the presence of fat causes less insulin to be released, and the insulin that is released doesn’t work the way we expect. It’s a paradox: cells are starving, and cry out for more glucose, but because they have become “insulin resistant”, insulin is unable to effectively move glucose into the cells. Less glucose is absorbed by the cells and it accumulates in the blood. Inflammation is the general term for the body’s response to injury. If something damages you, or if an invader tries to occupy your body, it’s the inflammatory mechanism that kicks in right away. Inflammation carries risks, however; inflammation in the absence of injury or invasion is doubly dangerous. Metabolic syndrome includes an increased tendency to inflammation. Currently, we don’t have very good ways of measuring this, but a substance called “C reactive protein” is the best yardstick we have. Increased blood pressure, more lipid deposits on the inner walls of arteries, and increased inflammation, all lead to blood clotting. Let’s say there’s a hole in you. As blood squirts out, there are ripping forces that stimulate specialized cell fragments and proteins in the blood to form clots and plug the hole. In the case of metabolic syndrome, blood pressure, fat deposits clinging to the walls of blood vessels, and roughening of the walls of blood vessels all work to increase the ripping forces on blood. Clots form where they shouldn’t, inside of blood vessels, and then can travel to the lungs, or heart, or brain, causing tremendous damage wherever they lodge — deep venous thromboses, heart attacks, strokes. I’ve fought gluttony, and I was aware that something needed to be done long before I was able to do anything. It’s not easy. After my successful weight loss, I became a support group leader. Now, I see others fighting the perceived sin of gluttony, and I can see how hard it is to fight alone. It is clear to me what a powerful adversary gluttony is. Why do some methods work better than others? None works particularly well. The range of choices lies between near-impossible and total failure. In one recent study, people who followed a diet lost an average of two pounds in a year. People who followed a diet and attended a support group lost six pounds in a year. Most of us would find that a minimal benefit. The secret is in the math: if one person loses sixty pounds, but nine others lose nothing, then the average weight loss is six pounds for those ten people. Even the “best” method doesn’t work well. We suffer under the pressure of our fallible human genes, pushing us to gluttony, and we’re driven by hormones and brain circuits that are mostly out of our control. The two weapons we have are willpower and the moral force of groups. Studies have shown that people gain, or lose, weight in social groups. Just like the body itself has homeostatic balancing mechanisms to regulate a preferred level of substances like glucose in the blood, it seems that people interact with each other to influence their own set points. We get fat in groups, and we lose in groups. Clearly, social support mechanisms (or lack of them) have a tremendous influence on people’s behavior, which we’ll revisit as we look at “Temperance.” Tiny, atomic-level feedback loops in the body’s chemical reactions are controlled by larger feedback loops in cells and hormones, which are controlled by still-larger feedback loops operating at the level of clubs, churches, friendships and families. 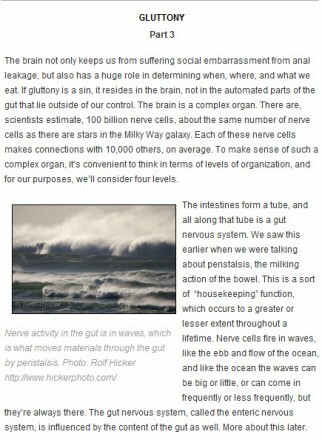 No wonder we find it so hard to understand the sin of gluttony, much less control it.